Dogs have been bred for the purposes of hunting with humans for centuries. Whether hunting for food or sport, various breeds of dog have been used to help flush the hunted animals out into the open, to retrieve downed animals (especially ducks, pheasant, and other birds), and to sniff out and track animals for the hunter. It is with these potential duties in mind that a hunting dog should be chosen. When choosing a dog for hunting purposes you may want to evaluate your needs and base the choice on what you want the dog to do, how easily it can be trained, whether it is likely to be “spooked” by the report of a weapon being fired, and how good its nose is. Hunting Breeds There are several breeds of dog that have a natural aptitude for assisting in various aspects of hunting. Hounds, for example, make excellent trackers, especially bloodhounds. They have a very acute sense of smell, even for a dog, and have no problem following several scents at once. Retrievers are quite keen at, well, retrieving. And make excellent bird-dogs. Hunting breeds are separated into four general groups. These are the general hunting dogs, gun dogs, retrievers, and bird dogs. Some specific dog breeds may fit into more than one category. 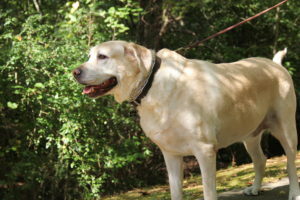 Retrievers Golden Retrievers and Labrador Retrievers are experts at finding and fetching fallen prey. They are especially useful on duck hunts because their oily coats help them move effortlessly through water to find and retrieve the fallen waterfowl. Pointers and Setters These dogs are useful in hunting because they let the hunter know when prey is nearby. They are most often used in bird hunts and are trained to freeze and point their bodies in the direction of the hunted bird (pointers) or hunker down low to the ground when they locate a bird (setters). Spaniels also make good pointers. Hounds and Trackers Bloodhounds and other dogs with heightened senses of smell are used to track all manner of animals. Whether it is their traditional use in the British fox hunt or their usefulness in tracking down deer, bears, and other such game for hunters in the US, they serve their purpose exceptionally well.